We must all change our attitude to the Earth we have and look after her even better. We must work positively together not negatively arguing selfishly. This for our own and all others' benefit. So here's hoping and working for health, happiness, success and enough wealth. The Pirate has his training "circuit"...an old bit of the main road about 8 k long..quite "lumpy" too. Today was the first time I'd ridden it on a decent (borrowed) road bike. You can add a "sting in the tail" by riding up one dead end (or "no exit" road it is called here) called Hill Road...as they say, it does what it says on the tin!! and looking up to the hill... and unlike Scots and Welsh hills, they go steeply up....and steeply down, no plateau in sight. This is our last day officially in these colours as we both change clubs for 2013. Funnily enough we'll just be swapping club nationality...as he'll be riding for Bush Healthcare, a Welsh racing team, and I'll be a member of the Sandy Wallace racing team from Fife! Then I left The Pirate to do two more hour's riding, and came back across a local small road. cow dung is very corrosive to road metal. In most places now they are not giving any licences for cattle to cross the road, and underpasses are built for the road crossing. This is also quite near the cycle track, financed personally by the NZ prime minister from his own pocket. This goes from Te Aroha to Thames with a branch off near Paeroa towards Waihi, and is steadily growing. It is a pity to see the railways struggling...but good to see the track being constructively used. Say no more....I'll stick to reading the book!! It does bring good business to the town, I'm not knocking it! As it was 5pm, we headed for a coffee shop....and there are may everywhere! This was The Redoubt.. good coffee and plenty of history on the walls, sporting and otherwise. Bill Riddell was the last of the East Coast drovers, c. 1966. As far as I could make out the writing at the bottom it says " Bill brought the stock from Opotiki to Ohinewai, 600 mostly 18 month old Herefords and Polls. Bill started droving in 1936.....sending forward....each unit took 3 months"
Talking to the artist, Judith M Dixon, who lives next door in Te Aroha, she said that this is correct. Luckily were were in the car, not on the bikes as it suddenly bucketed down with rain- almost as if you were standing under a tap! Then home across the Waikato again. I'm learning the road signs.....1845.3 on the road sign at one end means that it is 18.45 k long, with 3 turn-offs....and some of those straight bits can be 10 k long!! From a distance I saw the falls at Wairere....impressive even from 10 k away! That will be another day's trip. it is based on 1" squares making up 5" blocks, and will be just over 25" square. It is made from 100% cotton fabric and thread with 100% wool batting/wadding. I've been inspired by the success of Andrea from Boxes and Bellows, and when it is finished it will go on sale first here! Apart from carrying on with the tacking (pink-so that I will definitely NOT miss taking any out!!) ready for the quilting, I must research the price. I haven't sold any of my quilting since 1998! Meanwhile the weather here in the Waikato (and further south too, I hear on the weather forecast) is wet. Goodbye cyclone Evan, that flattened Samoa and Fiji and gave us heavy rain a week after....hello cyclone Freda (?) who is wreaking havoc in the Solomon Islands at present. 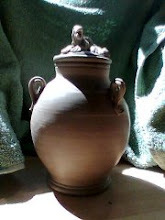 Thanks to all those bloggers out there who inspire me, the potter bloggers who keep me going on in clay . Thanks to the commenters who help me and give me a smile and spur me on to write yet another post...nearing 1,000 now!! Unbelievable!! As Hermitwitch commented, gratitude seems thin on the ground in this age of instant communication. We certainly had a Kiwi Christmas to remember...present opening ceremonies, breakfast on the barbie with champagne, party lunch in a farm garage and and even bigger party supper in a double garage. What else are they for!! This goes on until all presents are unwrapped, and exchanges can be made, if the one who is losing their choice agrees. You can imagine the choice of presents....men's hair dye....garden gnomes.....a pink toolbox (much coveted!! )...chocolates....wine....plastic grass skirts.....a small red plastic picnic table which was really a condiments set....the star of the night, and much "stolen"!! looking over our roof, this was a double rainbow, but the upper arc didn't show on the photo. It is frustrating how the reds, apricots and turquoise colours of the stunning sunsets here do not show on my photos. I'm using a canon 7.1 megapixel with a zoom lens- but it seems common to digital cameras...I may be wrong, I'm just learning on these...I knew where I was with film....even more skint than now!! Our tin shed. Chicken shed behind with......chickens!!!! Rain in the UK and steady heavy rain here-the tailend of Cyclone Evan. It is....interesting, when you're sleeping in a tin tent!! I think the laptop is working....a friend has checked it, run it, and it hasn't switched of....possibly the Kiwi style of plug is at fault...they slip out easily....I'll get a surge protector after the holidays too!! The quilt now has an inch border of little squares and a final two inch border of black....next step wadding and quilting! I think my computer is dying....so news will be sporadic until this can be sorted. RR, I didn't realize the Pohangina Pete was your nephew....I've just commented on his beautiful and striking images. Which called for indoor activities. and Taz the cat helped(?) to play mousehunt game on the computer!! The Pirate has been away in Manukau all day being busy..he'll be home any minute and it will be good to see him. Is this what I think it is, pray? To some, 1880 is ancient...after all, it is fifty years after the beginnings of Te Aroha, with the Gold Rush. This is the museum in the Domain, which was built then, along with the gardens, bath house with the geyser, pools and information centre for tourists. Yesterday I went to the Arts Society in Te Aroha- there were about half a dozen women there, not so many as usual as it is nearing the end of term, and next week they will be hanging the christmas exhibition of paintings. Various media were being used, oil, watercolour, oil pastels and acrylics, and I did a drawing in ink and pencil of the view through the front window. Surprisingly most members seem to be originally from the British Isles, and all have been here at least twenty years. However they are all of the lend a hand and share mentality, not the do it the British way wherever we are sort!! While I was doing that, The Pirate walked to the top of the mountain with T's labrador dog!! He couldn't tell me that it was steeper than he remembered at the top...so it was a good thing that I wasn't with him!! He couldn't tell me that he was having problems with his reactolite spectacles-as soon as he went back under trees he couldn't see. He couldn't tell me he was taking much more time coming down than expected.....so I was sitting in the Domain (park) for an hour longer than expected....more sandfly bites on my legs. We both slept well last night...and the dog did too!! Between Te Aroha and The Bombays is a rain belt. After heavy overnight rain, we had a hot dry day. The mack trucks look like REAL trucks!! A passage roof in the shopping centre. Everywhere is surrounded by indoor and outdoor malls and trading estates . This is killing the centres of cities and towns. Back to Te Aroha in the afternoon and from further away you can see how big it is. back across the Waihou River to the clock at the centre of town. Bald Spur (no longer bald! ), that we walked up to the lookout is the nearer, middle peak, Te Aroha mountain with the mast is to its left.